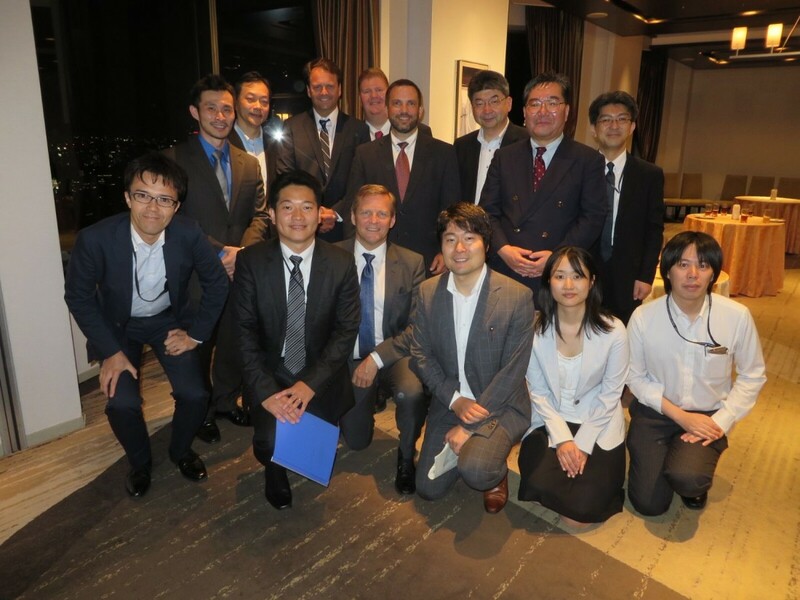 On June 24, 2015, Daniel Lent, Cantor Colburn’s Japanese Practice Group Chair, spoke in Tokyo on recent rulings from the U.S. Supreme Court and Federal Circuit regarding patent claim construction. Mr. Lent’s audience was Chief Judge of the Japanese Intellectual Property High Court Ryuichi Shitara and seventy court officials and other attendees, including visiting intellectual property professors from Stanford Law School. The following day, Mr. Lent again presented the same topic to Japan Patent Office Commissioner Hitoshi Ito, Deputy Commissioner Yoshitake Kihara, and other officials at the Japanese Patent Office. Above, at the reception following Mr. Lent's June 25, 2015 presentation, are pictured Commissioner Ito, standing second from left, Mr. Lent, standing third from left, and Deputy Commissioner Kihara, standing third from right. They are pictured along with other officials from the JPO.